The government has come under fire because a key UK train manufacturer - Bombardier - was not given the deal. A new train-making plant will be built at one of the following places - Ashby de la Zouch, Sheffield or Gateshead. As well as the new factory, there will be new depots in Bristol, Reading, Doncaster, Leeds and west London and upgrades to existing depots throughout Britain. The first of the new trains - which are designed to be faster, greener and able to carry 21% more passengers - are scheduled to enter service on the East Coast mainline in 2013, and to be fully operational from 2015. A typical journey between London and Leeds will shorten by about 10 minutes, between London and Edinburgh by 12 minutes, between London and Bristol by 10 minutes and between London and Cardiff by 15 minutes. The fleet will link London with Cambridge, Leeds, Hull, York, Newcastle and Edinburgh and connect London with the Thames Valley, Bristol and South Wales. The consortium, called Agility Trains, is made up of John Laing, Hitachi and Barclays. Transport Secretary Geoff Hoon described the plans as the single biggest investment in inter-city trains for a generation. He said: "This announcement demonstrates that this government is prepared to invest, even in difficult economic times, by improving our national infrastructure. 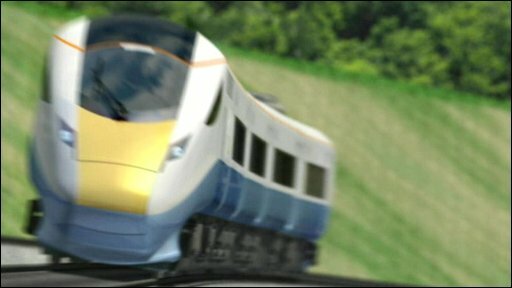 "It is good news for the British economy that over 12,500 jobs will be created and safeguarded, good news for the regions that the government is supporting significant inward investment, and good news for passengers that we are taking the steps necessary to improve their rail journeys." Keith Hazlewood, of the GMB union, said: "What a spark of good news amid all the gloom. GMB steelworkers will look forward to getting their share of these new jobs." However the decision to go with the Agility Trains consortium was a blow to a rival bidder for the contract, which included Bombardier Transportation. The firm is the only company in the UK that makes trains, with a factory in Derby employing over 2,000 workers. But there was some good news for the company as Mr Hoon also announced the Department for Transport was in advanced negotiations to provide 120 new carriages for the Stansted Express service from London Liverpool Street to Stansted Airport, the order for which is expected to go to Bombardier. Colin Foxall, chairman of customer watchdog body Passenger Focus, said the new fleet was "a significant step forward" that is "urgently needed". The decision was also welcomed by Alec McTavish, director of policy and operations for the Association of Train Operating Companies. He said: "The fleet will provide long-distance operators with the trains they need to meet the needs of a growing market and passengers with an attractive, cost-effective travel choice." He added that this "is essential if rail's potential to reduce the UK's carbon footprint and transport congestion is to be realised". But although Theresa Villiers, shadow transport secretary, also welcomed the announcement, she said the plans had taken too long to finalise. "The procurement process for this project has been painfully slow and very expensive, demonstrating that government micromanagement is pushing up costs and slowing up progress on improving our railways. She added: "And there is still no sign of the 1,300 extra carriages that the government have been promising for years." The issue of the promised 1,300 extra carriages was also pin-pointed by Liberal Democrat transport spokesman Norman Baker. He said: "The government seems very keen to announce new trains but not so keen on building them... This is a crude attempt by Geoff Hoon to gain political advantage by announcing this straight to the media, rather than before Parliament." And the substance of the announcement also came under scrutiny from Bob Crow, general secretary of the RMT transport union. He said: "The transport department has not answered the basic question of whether these trains will be manufactured in Britain or simply assembled here. "We have been campaigning long and hard to protect what is left of Britain's train-making capacity and skills base, and, if the basic manufacture of these sets is to be undertaken elsewhere, today's announcement will have been a triumph of spin over substance. "We need to know why the order was not placed with Bombardier, which has established train-building capacity and a skilled workforce in Derby." He added: "If Japan can manage to ensure the high-speed fleet that operates on its own railways are manufactured entirely at home, there is no earthly reason why Britain cannot either."